Planning your Easter menu? Um....wait...Easter this coming weekend?? Oh right, better get on that one! IF you are celebrating Easter with family this weekend, you might consider a classic rack of lamb for your Easter feast. You might be thinking that's too complex. Trust me, I know! That's exactly what I thought before I tried to make it. It's a lot easier than you think. That's why I'm including a basic roasted rack of lamb recipe below. It's plain easy to do. It's delicious. And it's perfect for Easter. Oh and did I mention you can buy your meat at Costco? BONUS! Still too complex?? Trader Joe's sells rack of lamb in the freezer section that you can pop in your oven! We love LARABARS in our house. Ever had one? LARABARS are a "delicious blend of unsweetened fruits, nuts and spices - energy in its purest form" (according to the description on the website). It's a great alternative to a cookie! This weekend, I was excited to discover that Costco sells a LARABAR 18-bar Variety Pack for $15.59. Such a great deal!! Need to Save Time? Get Pre-Cut Butternut Squash from Costco. Not sure about you, but I've got a toddler and an infant and certainly don't have the time and/or patience to deal with carving up a butternut squash. And I don't want to end up in the emergency room, either. I love this fall / winter squash, but its the effort and the mess that keep me away. So, you can imagine my shear delight when I learned that you can purchase pre-cut / cubed butternut squash from Costco. Halellujah, get the soup pot out!! Our favorite soup, Butternut Squash & Apple Soup, just got easier to make. Don't forget about hummus for school lunches. You can send it with whole wheat pita or pita chips or carrots or put it in a sandwich or lavosh/tortilla roll up. You'll find rave reviews across the Internet. Once you experience its robust flavor and super creaminess, it's hard to embrace another hummus in your life. 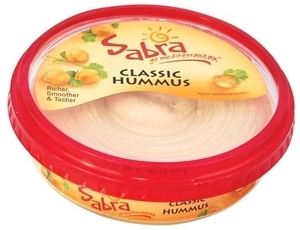 See this review of hummuses on the market and see why Sabra comes out on top. It's not just the kids that love mini foods. Grown ups really dig them, too. The slider (mini-burger) craze has been sweeping the nation and has landed on many a menu as an appetizer or small plate at trendy restaurants. I must admit that I love it when my dad gets excited about a new culinary find. (He's actually quite good at finding the latest kitchen gadgets). 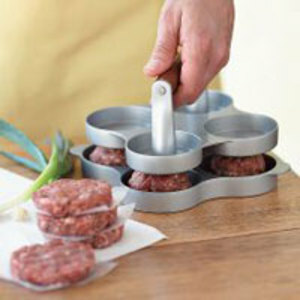 And I'll give him full credit here for discovering the Mini-Burger Press at Williams Sonoma. Ever since he bought the press, sliders have been one of his go-to dinners for entertaining friends and family on game days, beach party weekends, etc. And that's what we did on the 4th of July -- picked up a load of hamburger meat from Costco, a large package of Hawaiian rolls (of course, you can find these at your local grocery store, too) and whala....mini-burgers to celebrate our nation's b-day. Delicious and a cost-efficient way to feed a lot of people. But most importantly, it's something that both kids and adults alike can enjoy! Just for the halibut (he he), why not buy your fish from Costco?? This week, we threw some Costco halibut on the grill and it was outstanding. Now, I wish I could say that our daughter enjoyed it as much as we did, but then I would be lying to you. (I vow to offer it again to her). My hubby turned to chef Suzanne Goin from Lucques & AOC for her expertise. Here's what he did (excerpt taken from "Sunday Suppers at Lucques." 1. Season halibut with zest of lemon, 1 Tbsp. of fresh thyme and 2 Tbsp. of fresh parsley. 2. Cover and refrigerated it for at least 4 hours. 3. Take fish out to reach room temperature. 4. Get your fire or grill pan going. 5. Brush halibut with olive oil and season with salt and pepper. 6. Place fish on the grill and cook 2 minutes. Give a quarter turn and cook for a minute or two longer. Turn over and cook for 2 - 4 more minutes (depending on thickness). Peek inside to see if it is done. When halibut is cooked through, it begins to flake and separate. We served this with mashed potatoes and a green salad. We've also eaten salmon from Costco and loved it, too. So if you're on a budget and still want to eat like a king, go check out your fish selection at your local Costco. It was another cold day in Los Angeles. And it was a very, very busy day for our family. We needed an easy dinner, a one pot meal that warmed to the core. What we needed was a little Coq Au Vin, French for chicken cooked in red wine. Oui Oui, Monsier! My husband who is the expert on all things braising was the mastermind behind the dish with inspiration from Julia Child and The Silver Spoon cookbook. 1. Saute onions, garlic, mushrooms and thyme and cook over low heat, stirring occasionally for 5 minutes, then sprinkle with flour. (**Technically, you are supposed to saute 1/2 cup of pancetta here, too, but we are trying to be a little healthier. The taste is even better when you add the pancetta.) Add tomato paste. 2. Add the chicken. Cover and cook 10 minutes. 3. Pour the wine in and season with salt. Cover and simmer over low heat for about 30 minutes until tender and cooked through. This can be served with rice or pasta. We threw in diced potatoes while cooking our chicken a la pot roast style. We also served this dish with roasted butternut squash (cut into strips, tossed with olive oil and kosher salt; roasted at 450 until golden brown on edges). We also sauteed brussels sprouts (ends cut off, outside layer peeled and cut in half) in some olive oil until edges started to brown. Then, I added a few Tbsp. of chicken broth and continued to saute them until golden brown. This meal got me thinking....if only we were in France, if only this Charles Shaw Shiraz was a fine Burgundy. If only. Oh well, we can't always have it all, but this meal makes me feel just one step closer.